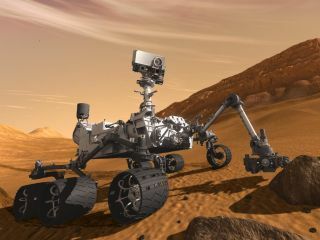 This artist's concept features NASA's Mars Science Laboratory Curiosity rover, a mobile robot for investigating Mars' past or present ability to sustain microbial life. Curiosity launched toward the Red Planet on Nov. 26, 2011. New batches of plutonium-238 may become available to NASA starting in 2017, perhaps preventing feared shortages of this vital spacecraft fuel. The United States hasn't produced plutonium-238 — a radioactive isotope that's been powering NASA space probes for five decades — since the late 1980s, and planetary scientists say stockpiles are worryingly low. But a production restart is now underway, say officials with the U.S. Department of Energy (DOE), which supplies plutonium-238 to the space agency. "We have turned the spade in starting the project for renewed plutonium production," Wade Carroll, DOE's deputy director of space and defense power systems, said in March at the Nuclear and Emerging Technologies for Space (NETS) conference in The Woodlands, Texas. "It'll take probably five or six years before the next new plutonium is available." Plutonium-238 is not used to make nuclear weapons (though its isotopic cousin, plutonium-239, is a common bombmaking material). Scientists do take advantage of plutonium-238's radioactive nature, however. The isotope emits heat, which can be converted to electricity using a device called a radioisotope thermoelectric generator. RTGs have long been the power system of choice for NASA missions to destinations in deep space, where scant sunlight makes solar panels impractical. RTGs have powered some of the space agency's most famous spacecraft, including the two Voyager probes that are nearing the edge of the solar system and the Cassini spacecraft currently surveying Saturn and its moons. Artist's concept of NASA's Cassini spacecraft at Saturn. While the DOE doesn't publicly disclose the size of the nation's plutonium-238 stores, many planetary scientists think the cupboard is almost bare after the November launch of Curiosity, which carries 8 pounds (3.6 kilograms) of the stuff. "We're down to one more trip out to do some exploring, and that's it," New Horizons principal investigator Alan Stern told SPACE.com late last year. "It's just crazy. To be that close to the edge before we're out of capability is irresponsible." NASA officials, for their part, have said there's enough of the isotope left to fuel space missions through 2020 or thereabouts. So Stern and others have been pushing for a restart of plutonium-238 production. It's important to get things going soon, they say, because the process takes a long time. "Targets" made of neptunium-237 must be fabricated and then irradiated in a nuclear reactor to make plutonium-238. For the past several years, both NASA and the DOE have asked for money to fund a restart. They estimate it'll cost between $75 million and $90 million over five years, and the two agencies want to split the costs (since the DOE makes the stuff and NASA uses it). Congress has given NASA some money — $10 million both last year and this year, for example. But lawmakers have denied the DOE's funding request for three years in a row, Carroll said. Despite the bad budget news, some restart planning and technological development are already underway, according to Carroll. And NASA is doing what it can to help the project along. "Right now, I think there's $10 million in this year's budget and $10 million in next year's budget, which we do plan on sending to the Department of Energy to continue the efforts that we've begun," Leonard Dudzinski, a NASA program executive who deals with radioisotope power systems, said at the NETS conference. "I'm fully confident that we will be able to continue this, and ultimately have plutonium produced in this country again in kilogram quantities, on an annual basis," he added. The goal is to eventually produce between 3.3 pounds and 4.4 pounds (1.5 to 2 kg) of plutonium-238 per year, which should be enough to support NASA's robotic planetary science missions, Dudzinsky said. "Now, if there were other missions that came along on the human side, then I think we would need more," he added. "But to date, those missions have not materialized."